A Quick List to This Update's Latest Foxglove Stuff! PandaFox debuts with a talented drawing of Foxglove dressed as a japanese ghost warrior from a popular Capcom video game. Speaking of dress, Liddy and I finally got out of Macy's with six evening dress styles for you to choose from :"). The arson crimes are still going strong, and short of a fire, the Feature gets a few minor changes, too. 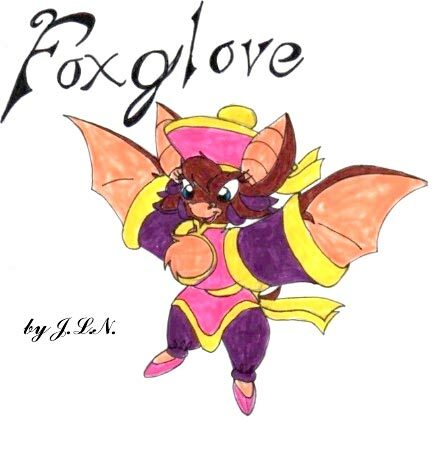 Foxglove dressed as Hsien Ko, a popular warrior from Capcom's Darkstalkers. Those sleeves hold more than just her wings ;). Meet 'lil Nick, Dale's adorable son from Rosey Collins' stories. When Liddy is around, you can bet he isn't far behind ;). Liddy is Foxglove's bubbly best friend from many of Rosey Collin's stories. 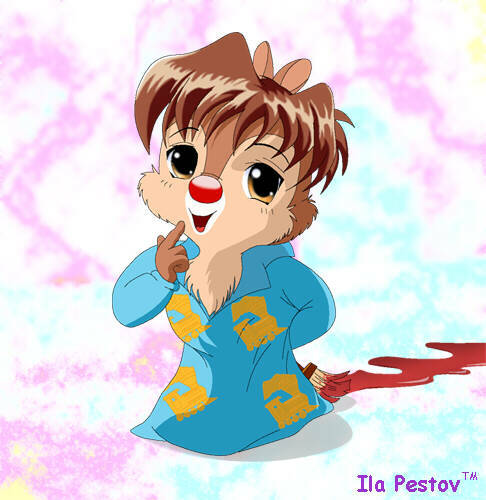 In this picture, she's every bit as cute as Foxy! "Angels in the Garden - Out from the Cold" (8-7-2000 Chapters 5-8 available!) 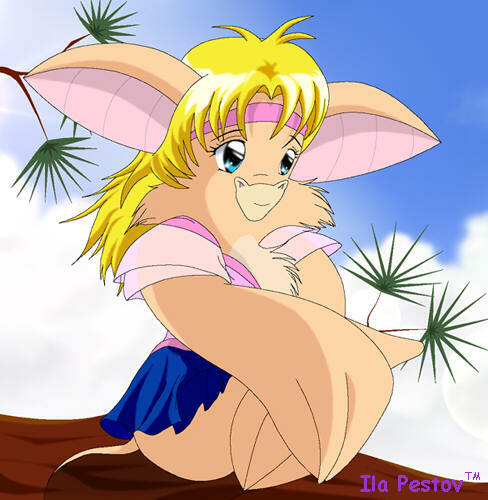 Holding a deep secret that caused her to flee the chipmunk she loves, Foxglove now lives with a mouse named Apollo Thistletoe and hummingbird, Humprey Castlehopper - friends she had met in a forest that quickly became family. They now are part of a small crime-fighting group called "Angels in the Garden". She however, cannot forget Dale, and the group's decision to travel to the city she left makes her feel even worse about her secret. Follow an exciting mystery that includes the Rescue Rangers, Rat Capone, and a mysterious fighter named Mouso, as it unfolds over time. Note: Apollo and Humphrey belong to this author. "The Guise of the Demon" (8-6-2000)Ben Porch and a French-speaking wolf named Wolfsbane roam Transylvanian country during their worldly travels. Little did they know that Foxglove and Dale were spending their vacation here with their children, Dani and Nick. You'll find that Ben hasn't changed much from his last meeting with her; Foxy is still very much on his mind. Much of what happens throughout the story is dedicated to Bram Stoker's classic horror story, "Dracula", but given Rosey's original style and great use of dialogue. Note: This story contains some mature situations. "Double Criss-Crossed" (8-5-2000) Disaster befalls the Rescue Rangers, during Dale's birthday as a terrible storm nearly destroys their home. The special gift that Foxglove and Gadget made for him helps save their lives. While looking for a way to recover what was left, Gadget befriends a sprightly young fox named Criss-cross. Little do the Rangers know is that "Chris" is, in the most literal sense, not what he seems. A hugely entertaining story with a plot that gives the story its title. Note: contains just a bit of mature language. "Yet Untitled RR Adventure" (8-2-2000 Chapter 4 available!) 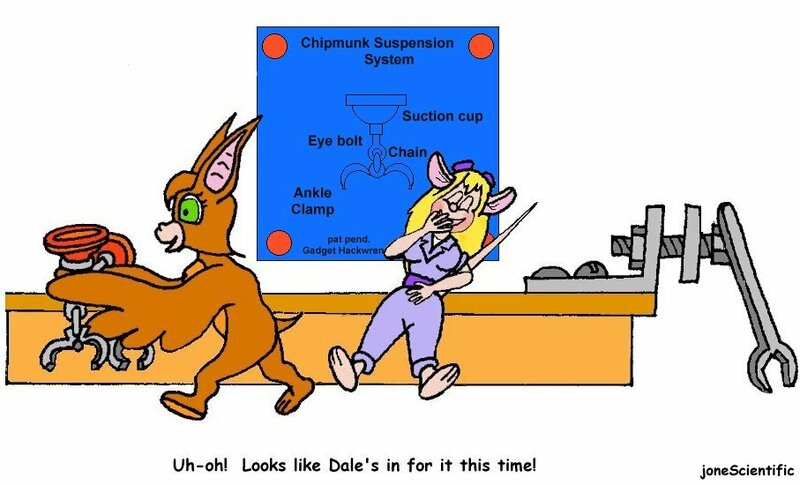 Follow Dale, Gadget, Foxglove and Chip chapter by chapter as they uncover the possible mystery about a mouse named Dan Gray. You'll also learn more about Dale and his struggle to fight both jealousy of this mouse's affections for Foxglove, but the lack of confidence in himself. Find out when the Feature is updated by email. Join the Foxglove Feature mailing list! All art & literature on this and other pages are copyright their respective artists, and used with permission, unless noted.